The smell of honeysuckle and lilac, the sight of beautiful magnolia blossoms that sparkle and fade all too fast and the sound of robins greeting each sunrise with joyful chirps are all welcomed signs of spring. One of the other sure signs of spring in the Forest City is the numerous construction projects which sat dormant during the winter but come alive as the snow melts and the days become longer. Last week, as a result of one of these many construction projects, I dutifully followed the detour signs through a subdivision close to the Education Center. 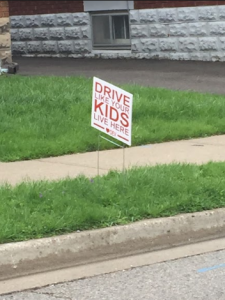 Along with the make shift speed bumps, I noticed this sign “Drive Like Your Kids Live Here” on many of the front lawns. I immediately slowed down and found myself taking extra care in checking my mirrors and blind spots. I watched for unexpected distractions such as stray balls rolling onto the road as a result of a missed shot in a driveway hockey game or all too focused dandelion pickers unaware of their surroundings and any potential dangers. I couldn’t help but wonder what would happen if we took that same sentiment and transferred it to our schools. What if on all of our schools signs we professed that we “Teach Like Our Own Kids Go Here”. I recall a time when I overheard a teacher complain that at her daughter’s school no one was stepping up to coach one of the sports teams. Yet that same staff member wasn’t volunteering any of her time at the school that she worked at to do any coaching. I found it rather ironic. When we think about the classroom environment that we want for our own children, do we do our best as edu cators to replicate that for our students? Do we greet our students at the door every morning and let them know that we are so glad that they are here. When there is an issue with another student, do we take the time to investigate and help problem solve the situation with care, kindness and fairness? Do we provide choice in our tasks and honour and embrace student voice because we truly believe that our students have something worthwhile to say? Do we take the time to read what our students are reading so that we can suggest that “just right” book and watch their faces light up because they know that we care enough to go the extra mile? Do we provide our students with multiple (differentiated) ways to demonstrate their learning, because just like our own children are individuals (I often wonder how my own three children, who had the exact same environment as children have grown into such individuals with their own set of unique strengths) our students have their own backpack of strengths. When assigning multiple tasks to be completed at home, do we as educators stop and contemplate the impact that our “homework” will have on our families. How would we feel as a parent of a student in our class, managing night time routines which include assigned homework? Over the years, I’ve been fortunate that many of my own children’s teachers where incredible and I’ve worked alongside of educators who “teach like their own children go here”. But what If we ALL taught like our children were in our class, can you imagine the impact?